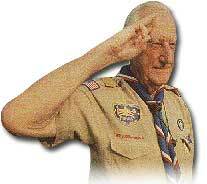 William "Green Bar Bill" Hillcourt is considered by many Scouters to be the Baden-Powell of American Scouting. He has had significant influence on the program of the BSA and the training Scouters recieve through Wood Badge in this country. Who was "Green Bar Bill"? William "Green Bar Bill" Hillcourt was born Vilhelm Bjerregaard Jenson in Copenhagen, Denmark in 1900. His introduction Boy Scouting came in January 1911, at the age of 11, after his parents gave him Baden-Powell's newly translated Scouting For Boys as a Christmas gift. Bill went on to become the Danish equivalent of an Eagle Scout. It was 1926 and Bill Hillcourt was a "Cub Reporter" for his Copenhagen newspaper. Bill talked his Editor into sending him to the U.S. for its first National Jamboree -- after all, Bill was a Journalist who was also one of Lord Baden-Powell's Scouts. The paper ought not be "scooped" by someone else by being absent from such an austere event where England's great Lord Baden-Powell would speak to the very first gathering of American Boy Scouts! The convinced Editor sent his Journalist to the U.S. to cover BSA's first Jamboree for the paper! Bill didn't return to Denmark. He broke his leg at the Jamboree and while awaiting passage home, visited Scout Executive Dr. James E. West at the BSA office on Times Square in New York City. Awaiting the building's elevator with his leg in a walking cast, the doors opened; Dr. West stepped out and Bill fell forward trying to step in -- right into Dr. West's arms! Two handicapped Scouters met abruptly. Bill's enthusiasm about Scouting and being a journalist led West to offer Bill his first job in the Supply Service of the new, expanding BSA Program. Later, Bill challenged West's implementation of the scouting program -- that BSA didn't follow Baden-Powell's Patrol Method correctly. West challenged Bill to write a replacement for BSA's 1910 Official Handbook, that had been published as an Americanized version of Baden-Powell's Scouting for Boys. Bill had already written his first book three years earlier at 23: a tale of Scout camping, based upon his own Patrol's experiences. But this book had to be written in English; boys not only had to read it, but enjoy it, and follow Baden-Powell's Methods. Bill always enjoyed telling his story of how a Dane with poor English came to learn our language well enough to write a best-selling book for American boys. To improve his English, particularly when it was already corrupted with "Americanisms", Bill used to go to Times Square to watch movies. He spent two months on BSA's payroll attending American movies He'd watch a morning matinee; then a different early-afternoon matinee; then yet another late-afternoon matinee. This is the way Bill learned the collogial American language of English. His first Boy Scout Handbook was a smashing, run-away, best-seller success; it was written as Boys talked. Boys understood it; they liked it; and they followed it. Bill's new BSA career was off to a running start. Bill Hillcourt went on to write a Patrol Leader Handbook, a Scoutmaster's Handbook, and the Field Book; then updated them from 1929 until he retired. In 1932, while writing the various handbooks, Bill started to enliven the pages of Boys' Life with his famed Scoutcraft features, leading generations of boys into the outdoors. For four decades until he retired, Bill wrote his feature columnunder his pseudonym of "Green Bar Bill", with a logo of "Bill" hand-written on top of the two green bars of a PL. Bill became involved in Wood Badge in 1936 when John Skinner Wilson, Camp Chief of Gilwell, came to introduce Wood Badge to the United States. After adapting the training to the BSA program, Bill served as Scoutmaster of the first two courses (and many others thereafter). You'll want to hear more about this. The Silver Buffalo, BSA's top Scouting award. The Bronze Wolf, World Scouting's highest award. William "Green Bar Bill" Hillcourt was a personal friend of Baden-Powell. When Bill died at 92 on November 9, 1992, in Stockholm, Sweden, he still had several of Baden-Powell's original, signed sketches hanging unadorned on his apartment walls in Manlius, NY. Two copies of Baden-Powell's original serialized newspaper articles that became Baden-Powell's Scouting for Boys sat idly yellowing on a bookcase shelf beside several autographed first-edition copies of Baden-Powell's Scouting for Boys.